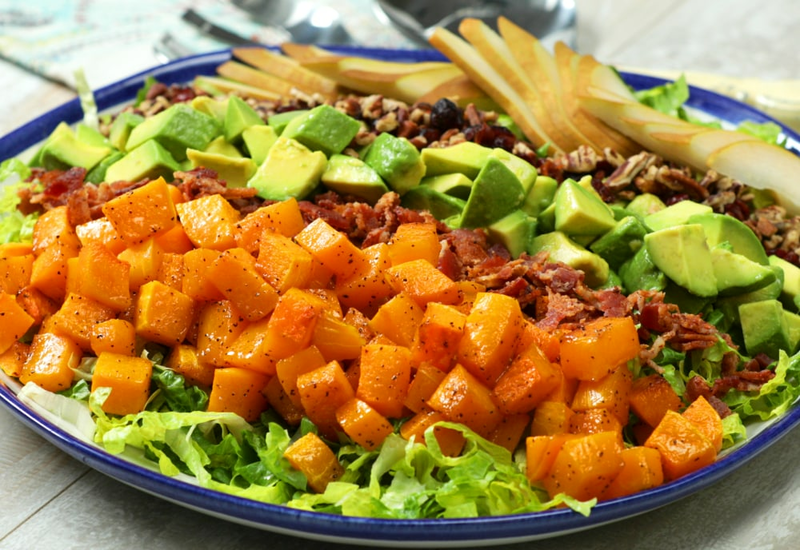 This recipe reimagines the Cobb salad to feature seasonal squash, dried cranberries, and pecans with the more-traditional bacon and avocado toppings. Add chickpeas or black beans for extra protein. Slice corn off the cob for a fresh crunchy addition to the salad. Serve this as a hearty lunch. Top the salad with chicken and you have a full meal for dinner! Per Serving: 834 calories; 60g fat; 72.5g carbohydrates; 12g protein; 19mg cholesterol; 862mg sodium. What's not to love! This salad tastes as good as it looks! I've tried this recipe and it's delicious! I've always loved Cobb salad, and this winter version with squash and cranberries is so good. The classic bacon and avocado topping is perfect. I'm going to make this again for lunch this week. I could eat roasted squash all year and this salad is one of the reasons why! I skipped the maple syrup, but other than that, I followed the recipe and loved the way it turned out. I made this recipe out of convenience because I had some left over, roasted squash cubes that I didn't want to waste. I also added leftover rotisserie chicken to this salad. It had a good flavor, and because I already had cooked squash it made it easy to throw together. It wouldn't be a cobb salad with chicken and a hard boiled egg, so I added both of these ingredients to make this wintry version. I also used a red wine vinaigrette instead of the poppy seed dressing. The squash roasted perfectly in the oven. I actually left it in a couple minutes longer to get a nice golden color. This salad is perfect for entertaining.